By Graham Young - posted Thursday, 11 May 2017 Sign Up for free e-mail updates! There are two ways to look at this budget – politically and economically. Politically it is brilliant, redolent of the Menzies’ method of stealing your opponent’s clothes. It will be interesting to see whether it wins back the young family constituency, which along with older Australians, was the bedrock of Menzies’ ascendancy. Economically it is a disaster, although it does deal with the debt situation, but at a cost. And there are some redeeming features, such as its moves on housing affordability. 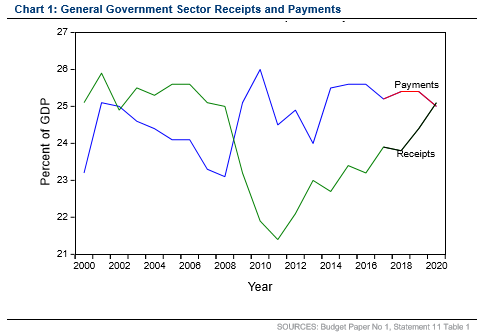 The budget cements in higher taxing and spending, as the graph below (sourced from Michael Knox at Morgans) shows. And it demonstrates that the government’s default response to claims for higher spending is likely to be to accommodate them, and raise taxes to fund them. We are on the escalator towards European rates of tax, and an Australia that looks more like the flabby one of the 70s, than the muscular competitor of the 90s. Tax rates are increasing and bracket creep will be a significant source of the improved debt situation. Part of the tax increase will also come from the 25% increase in the Medicare Levy. Australia will have some of the highest marginal tax rates in the world, and they will cut in at a lower threshold. This is a far cry from the days when Peter Costello delivered a virtual flat tax of 30 cents in the dollar for the bullk of wage earners. There is also a levy on foreign workers, and some reduction in negative gearing deductions. Probably the most heinous is the tax on bank liabilities. There is nothing that I can see to distinguish this in principle from the Mining Super Profits Tax which Labor brought in and which was rightly criticised by the then Liberal Opposition. It is basically kleptocracy – you identify an industry that is making good profits and which a significant segment of the populace doesn’t like, and you opportunistically slap it with a tax explaining that it makes enough money and won’t miss this little bit. You then take the appropriated profit to make a good fellow of yourself. It is arbitrary, and increases sovereign risk. It is a penalty for running a good business, or being in a part of the economy that is booming (and if that part of the economy is booming then the government will be getting an increased tax take anyway). If you like what we are doing please either join (click here) or donate (click here). We need your support.